Hello Friends! Happy Monday. I hope you had a wonderful Thanksgiving weekend! My little family had a wonderful time with friends. And I have to say it was good for me to unplug for a few days — that’s why my blog wasn’t updated for most of the week last week. But now that we are in the leftover turkey mode, I am back to work mode! 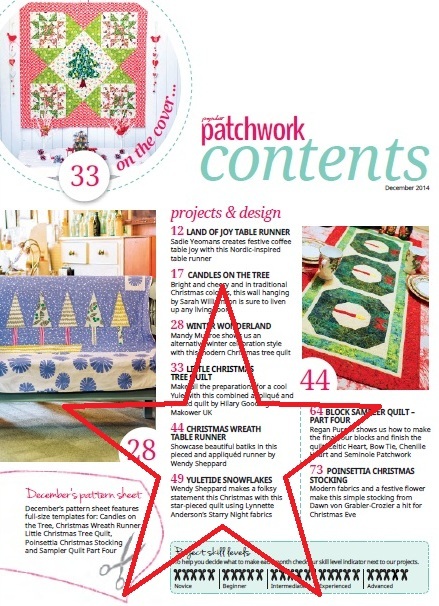 I had shared with you about having another featured project besides my Christmas Wreath runner project that is featured in UK’s Popular Patchwork December 2014 issue. Click here to read more about the runner. I am happy to share with you another Christmas project Yuletide Snowflakes. Many of us simply adore star blocks. 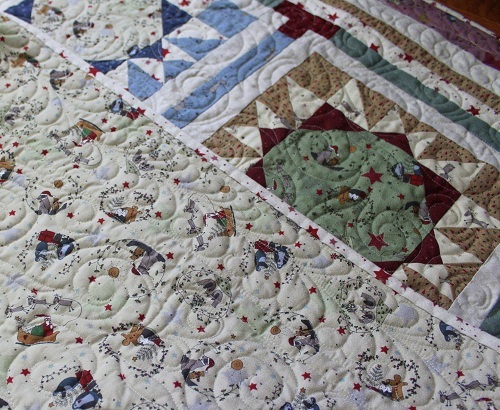 And this particular block reminds me of a snowflake, thus the name Yuletide Snowflakes for the name of my quilt. 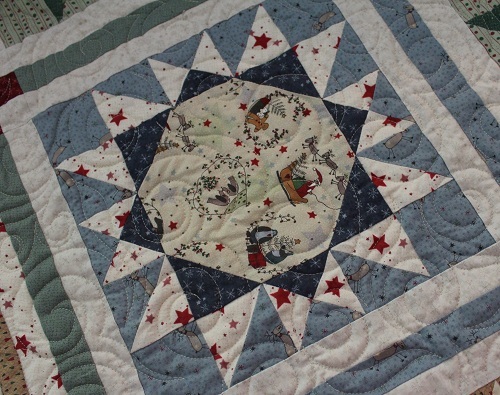 And I just had to use Lynette Anderson’s Starry Night fabrics to make a star quilt for the holiday season. The Starry Night fabric line is current, and is released by RJR Fabrics. 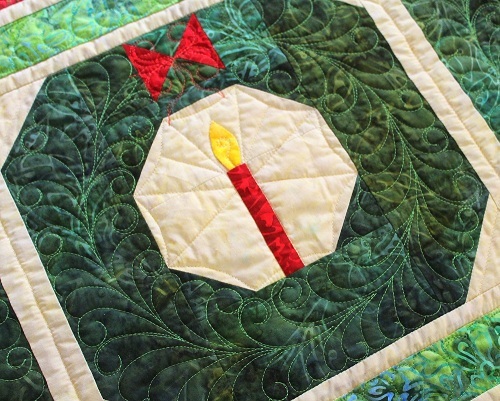 I love adding a bit of blue in the traditional green/red mix because that way the quilt can be used throughout the winter season. Here are a couple more pictures of the quilt. I always love that Lynette Anderson’s fabrics lend themselves to a scrappy look without much effort. I quilted allover swirl and Jester’s Hat to give a nice texture to the quilt. 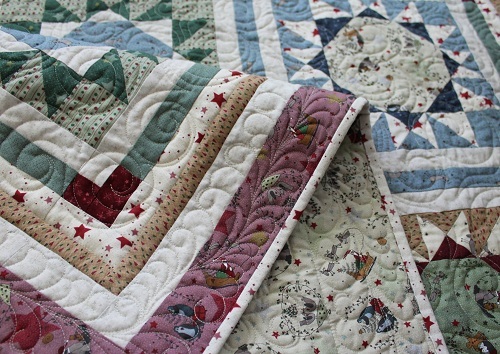 The nice thing about quilting allover motifs is that once you are familiar with the stitching paths of individual motifs, you can easily customize you own quilting by combining motifs! 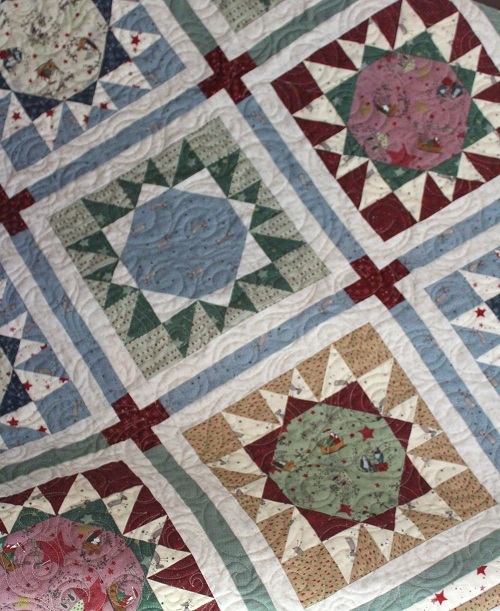 Quilting is done using Aurifil Mako 50 cotton thread over Hobbs Tuscany silk batting! Before I leave, I thought I would give you a run down on projects I have done using the Starry Night fabrics besides Yuletide Snowflakes. Click on project names for more information on individual projects. I have two more Starry Night projects to share – so stay tuned. I hope you have enjoyed Yuletide Snowflakes. Speaking of snowflakes – we are expecting rain and sleet tonight and tomorrow. Thanks so much for stopping by! I hope you have a lovely week, and HAPPY DECEMBER!! 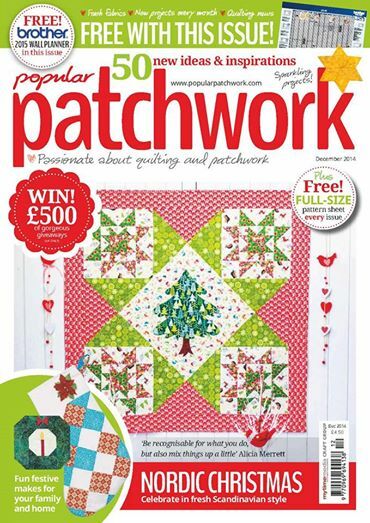 Click here for information to purchase/subscribe to Popular Patchwork. 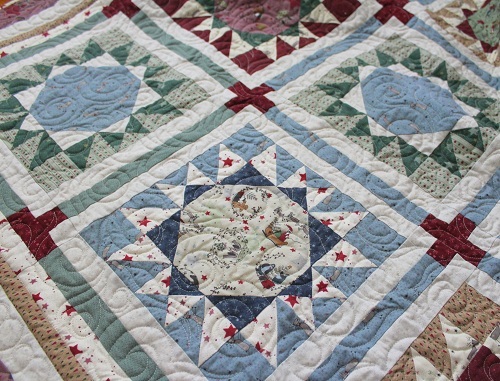 Click here for information on my online machine quilting class that covers free-motion quilting swirl and Jester’s Hat motifs. 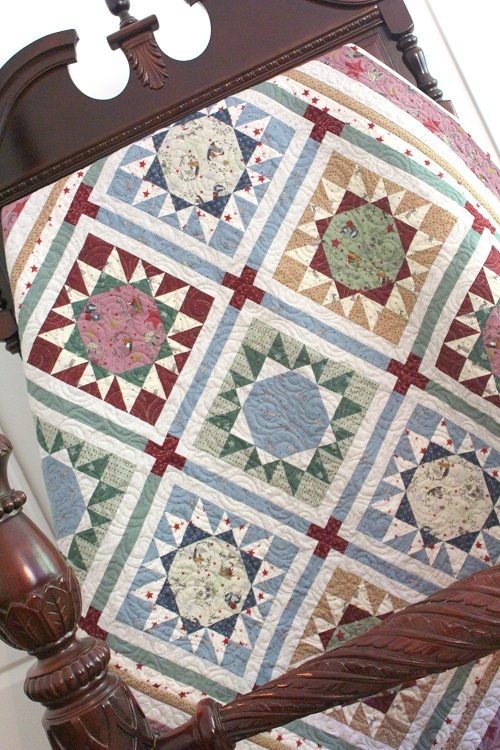 Click here and here for my virtual trunk show on star quilts. 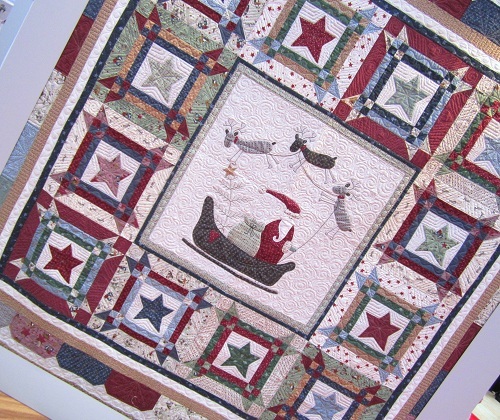 Click here and here for my virtual trunk show on Christmas projects. 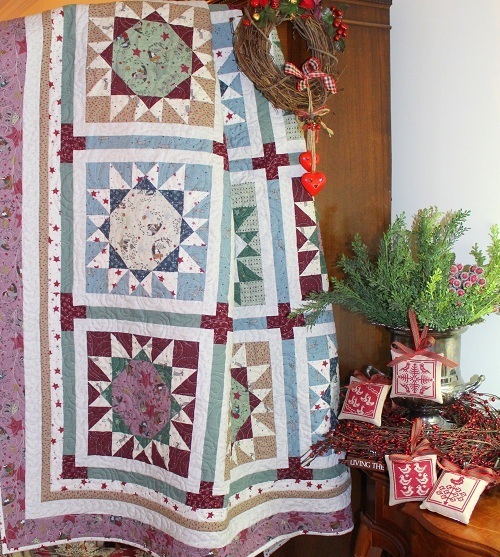 This entry was posted in Christmas, Quilt Pattern, Quilting, Quilts & Projects: Published, Quilts: Pieced and tagged Christmas Quilts, Star Quilts, Starry Night by RJR Fabrics, UK Popular Patchwork December 2014, Wendy Sheppard Designs. Bookmark the permalink. I’m happy to hear you took some time off and had a nice Thanksgiving weekend! Happy December to you! Up until recently, B&N had carried a small selection of AU quilt magazines……no longer. In fact, I checked yesterday and the quilting section of the magazine shelves has been reduced drastically. I know that there are many new quilt mags out there right now, but this is the smallest of old & new mags I’ve seen. Not happy at all!!! I’ve enjoyed past issues of AU “Quilter’s Companion” but no more (unless I subscribe, I guess). Love your designs and the fabric line is a perfect ‘fit’. Glad to ‘hear’ that you had some “unplug” time!!!!!! Hugs………. Love your Yuletide Snowflakes. Not only does it look like snowflakes, it has a soft, dreamy look. I would definitely leave it out the entire winter season. I am also liking Stars Aligned, it, too, has a soft, starry feeling. Glad that you had a “time-off” Thanksgiving. I bet that you are feeling “refreshed” once again.